"Penthouse + Huge Roof Terrace + Amazing Location Downtown!!" Bathrooms: 2 "Plus One open air at the Private Roof Terrace"
Lot Size: 968sq. ft. n/a "Huge Private Roof Terrace !!" This fantastic Penthouse for Sale in Playa del Carmen is walking distance to all sites you maybe interested in, 2 short blocks to 5th Ave. with all the shops, restaurants, clubs and of course the beach. Just take a look in the map! GREAT return over rentals, there is no other this size/price!! Nice Mediterranean architecture, Playakaan Condominium is in perfect shape, pleasant common area with pool and lounge area, 24/7 security, parking space and affordable HOA fee. 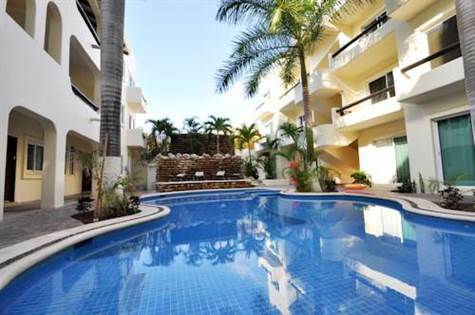 Located at 12 street and 2 short blocks away from 5th Ave, this 2 bdr condo for sale in Playa del Carmen will be the one for you, granite counter top at the kitchen, laundry room, nice wooden closets! None of the new developments has this kind of inner space, you can actually live in this Condo for Sale in Playa del Carmen, can be your perfect retirement dream spot; love making bbq´s? you have a huge roof terrace with jacuzzi, shower, and lounge area to enjoy all the sun you can get, with fabulous breeze, perfect to share with family and friends... this one has all you need!! Investor? You can start making money as soon as you buy it! It´s fully furnished and equipped with the location all visitors love! Only serious inquiries, appointments must be done in advanced. ▪ Great for vacation rentals! amazing price for this size and location!